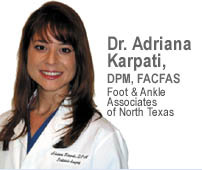 If you would like to ask Dr. Karpati a footcare or podiatry-related question, simply fill out the form below. Please refer to Dr. Karpati’s responses (below) on your topic before e-mailing, as you may be happy to find an answer to your question already posted here. The majority of questions are answered within a few days. Medical conditions are fact-dependent, so in addition to Dr. Karpati’s insights, it is important you consult with your personal physician before undergoing any footcare treatment. I have been having a problem with the feet, summer or winter they sweat they have order, I have been buying new shoes, because they are ruined, I change the socks two times in a day; I use powder about every two hours. I bought Dr. scholls inserts in the past and only use them once. Can your product help? Or do you know what else I can use; this problem is embarrassing then depressing. 1. Foot odor begins from the sweating and lingering of moisture on one’s feet. Summer Soles work to help control odor by dispersing away the wetness from your feet. 2. The sweaty feet you are describing are usually caused by the improper function of what is called the “sympathetic nervous system” which controls sweating of the feet. Though Summer Soles won’t keep your feet from sweating, they will make your feet feel drier by wicking the sweat away. 3. Summer Soles also acts as a barrier between your foot and the factory insoles of your shoes to help prevent deterioration of your shoes. This will allow to keep your shoes longer! If you still have some foot odor, you can buy some tea bags; the stronger the better – seep a pot full of tea for about 5-10 minutes, let the tea cool down, pour it into a basin and soak your feet in the tea for 10 minutes. The tannic acid in tea helps to reduce foot odor! Soap and water will remove the tea stains on your feet. Do this daily, making a fresh pot every time, until you can see a podiatrist. There is a prescription for Formalyde-10 spray. This spray is designed for certain types of foot odor and it is as strong as it gets. Hello, Is there a reason why this problem exists? In other words, can it be related to thyroid problems or any other disorders? Thank you! Thank you for a very interesting question. Excessive sweating may indeed be a symptom of other medical conditions including hyperthyroidism, gout, rheumatoid arthritis, tuberculosis, lymphoma, hypoglycemia, parasites, metabolic dysfunction, diabetes, liver disease, menopause and psychological disorders such as panic attacks. Some medications may also cause excessive sweating. In the cases where no causes are found, known as idiopathic or primary hyperhidrosis, overactivity of the nerves of the sympathetic nervous system, which send signals to the sweat gland of the skin, seems to be the culprit. Simply put, your feet sweat A LOT! There are some patients I see with this problem who carry towel with them to pat their hands and/or feet dry and who have beads of sweat form on their feet within the first minute of my evaluation! Everyone has different extremes even in the realm of patients with this condition. There is a wonderful site created by the International Hyperhidrosis Society that has a wealth of information. Click here to visit their website. Everyone’s feet sweat! The beauty of Summer Soles is that even with these different extremes, Summer Soles are able to keep your feet feeling dry and comfortable! Don’t despair! Summer Soles are here to help! Summer Soles will help absorb the sweat off your feet and socks to help keep you comfortable. They are your best first defense against sweaty feet and they really do work! Remember, all the sweat that has already gathered onto the soles of your shoes will make your feet smell bad. Summer Soles will add that layer of protection between your feet and the soles of your shoes! Next, try to always wear cotton or the newer athletic socks with your shoes. Nylon socks or no socks at all will make your feet sweat more and smell worse! Bring an extra pair of socks to school with you and change them mid way through school if possible. Also, try Dr. Smith’s “Deodorizing Foot Wash” if your feet have a bad odor. I do not know for a fact that your problem is from a release of toxins but I would suspect that if toxins were a factor, then your foot odor would have decreased over the course of the past 15 years given that there is less in your system now. I do know that the odor from bacteria can be controlled by first drawing away the sweat from your feet so it does not stagnate. This can be accomplished effectively with Summer Soles. Next, be sure to change your socks often if you can (use cotton or the newer athletic synthetics) and avoid nylon sock at all cost as this will aggravate your situation. Another helpful product to control odor is Dr. Smith’s Deodorizing Foot Wash. Thank you for your question! My feet will tend to sweat all the time. Sometimes there is an odor depending what hosiery I am wearing. I know if I wear cotton fabric that should help, but that can’t help when I wear heels. How can I minimize the odor? It’s pretty embarrassing! To get right to the point, first you need to cut down the sweat which causes the odor. You could not pick a better product than Summer Soles for this. Nylon is the WORST for making feet sweat so start “Summer Soleing” your shoes and sandals to help wick most of it away. Next, to help cut down on the odor, Dr. Smith’s brand makes a product called “Deodorizing Foot Wash” which you can apply directly to your feet. If you still have problems, add a spritz of any underarm antiperspirant to your feet in the morning. Thanks for your question! I have tried all kinds of treatment, powders, soaking two prescriptions, inserts, deodorants and nothing seems to work. What else can you recommend? This is such an embarrassment I can hardly stand to be around people. I need help! I wonder if acupuncture could help? It really sounds like you have run the gamut of conservative treatment for hyperhidrosis! At this point, you make a very good candidate for botox injections in the feet. This is an extreme control for people who have tried EVERYTHING and still sweat excessively. I must warn you that these injections can be painful sometimes requiring as many as 50 per foot and only lasts for several months. The good news is that the majority of the people who have had this done are extremely satisfied despite the temporary discomfort and say it is worth the trouble! Final thought, while you research botox as an alternative, please go ahead and try some Summer Soles. At the very least, they will absorb and wick much of this moisture away and keep those feet feeling more comfortable! Best of Luck! About a year ago my feet started sweating. I have never had a sweat problem prior to this. My feet sweat excessively and the odor they cause is literally aweful! They not only sweat extreme but they are hot like an oven as soon as Iput socks and shoes on. They also have a burning sensation. This isnt a little isue it actually somewhat limits and controlls my life. it is the most uncomfortable, painfull and bothersome thing in my life. I have tried drysol and dryoff and they dont work at ALL. Please help me on what to do. Im considering Lumbar Sympethectomy. Your symptoms do not sound like strictly like hyperhydrosis alone. The symptoms you are describing are seen in people with pedal neuropathy. Pedal neuropathy, easily put, is the slow death of the sensory nerves of the feet. This can be seen with various disease processes, most commonly diabetes. If you have a history of diabetes in your family and have never been tested, then I would not waste anytime in doing so. I suggest you also appoint with a neurologist who can test specific nerves to help eliminate nerve injury and neuropathy as causative factors. Good luck! I’m 33 yrs young female.My soles have become very slippery & smooth,maybe ’cause of sweating. (I walk a lot,will be on my feet a lot).My knee hurts. Please suggest me the shoes I should go for. The type of shoe you need depends on what you are using the shoe for(walking for exercise vs. walking as part of your job vs. on your feet standing a lot in your occupation) and what foot type you have. These are separate issues than finding a shoe that will help alleviate the sweating. You would really need to have your feet examined by a podiatrist to determine what foot type you have and how this affects your gait. Shoes, especially athletic shoes, are made differently to meet the different foot types and problems. Given you also have knee pain, you may also want to be evaluated for possible functional orthotics. These are made custom to your feet to help correct abnormal gait and properly support your foot and ankle. Having a good “foundation” so to speak, is an important aspect of body alignment and joint function. For the sweating, besides Summer Soles, you may want to look into the Geox shoe. It is a breatheable shoe that has a patented system with a semi-permeable membrane that absorbs sweat, yet keeps water out! Hi. I have a nine year old daughter who’s feet and hands sweat constantly. When she uses the mouse on the computer it looks like she wiped it with a wet rag. Her feet make all of her shoes smell horrible. She can’t wear sandles because of the amount of sweat in her shoes. It looks like she just walked through a puddle. She is starting to get embarrassed and recently stopped going to gymnastics because of this. I need a solution that will work on a nine year old. Thank You so much. My 9 year old granddaughter has sweaty feet and hands. Her mother and I are trying and looking everywhere for shoes that will absorb the sweat. She does not like the look of bergenstocks so when I saw this website I decided to try them out – I hope they work. She is too young for medication that will help her – any ideas? I hope you do not mind me addressing you both since it appears to be the same person you are writing about! There is a product called “Certain-Dri” which I believe I saw selling at Walgreens. Look at the specifics on the product at their web site http://www.certaindri.com/Pages/CD_Facts It is a very strong topical anti-perspirant specifically formulated to address this type of problem. It should help some and the Summer Soles will do the rest! Good luck! I work in a factory and have to wear steel toe shoes.I never really had a problem with my sweety feet till working 10 hr days .I have tried powders, but they just get wet and stick to my feet .I change my socks at work once but I know I could change them on somedays 3 or 4 times a day. My feet get sore and feel raw and hurt. I soak my feet and try to take care of them as soon as I am off work .What can I do ? Keep up what you are doing! Use the synthetic wicking sock you can find at sport stores instead of the cotton ones you are probably using and get to a podiatrist for a prescription of Formalyde-10. This stuff is strong enough to dry you out. Use any over the counter anti-perspirant for underarms on the soles of your feet once daily until you can get to your podiatrist. Summer Soles will definitely help to disperse some of that sweat so it is not just sitting in your boots and will help keep your socks drier. Good Luck! Prior to finding this miracle product four months ago, I have been terribly miserable and embarrased because of the odor from my feet/shoes due to my sweety feet. It was to the point where my co-workers didn’t want to sit anywhere near me and tease me behind my back (stange that I only experience this problem when I wear shoes). I am having to change out the Summer Soles quite frequently because of odor (must add sooo much better than before prior to Summer Soles)and desperatly hoping that you please help me with products to use adjacent to Summer soles. You have recommended J&J Band-Aid brand called “Odor Block” but I cannot find this anywhere. Additionally what brands or product of underarm antiperspirant (not deodorant) spray do you recommend because I cannot find the sprays at the stores (CVS, Walmart, Giant, Rite Aid, etc..). Please help me. So sorry to hear what you are going through! I hope I can help! First of all, I am sure you have already purchased the scented Summer Soles which are absolutely fabulous and will knock out some more of that odor! Unfortunately, J&J has discontinued “Odor Block” so it is no longer available. As far as anti-perspirants are concerned, any brand is fine. What I want you to start doing immediately, as crazy as it sounds, is go out and buy some tea bags; the stronger the better! Seep a pot full of tea for about 5-10 minutes, let the tea cool down, pour it into a basin and soak your feet in the tea for 10 minutes. The tannic acid in tea helps to reduce foot odor! Soap and water will remove the tea stains on your feet. Do this daily, making a fresh pot every time, until you can see a podiatrist. When you do, ask for a prescription for Formalyde-10 spray. This spray is designed for your type of foot odor and I am sure it will help! This is as strong as it gets! The easiest way to control your feet from sweating is by using any underarm antiperspirant. This will not stop all of the sweating, but it will help. Your feet will feel even drier by having Summer Soles in your shoes and sandals to wick away any remaining moisture you may have. And with summer just around the corner, now is the time to prepare and start “Summer Soleing” your footwear! Also, to help cut down on the odor, Dr. Smith’s brand makes a product called “Deodorizing Foot Wash” which you can apply directly to your feet. This does sound very distressful for your sister-in-law. Unfortunately, without a proper examination, I do not feel it is appropriate to try and guess as to what this could be. Is there some neurological component that causes her “feet to arch” or is this purely biomechanically induced? Is the sweating more of a direct response to the pain or independent of it? There are many questions to be asked by a professional to get to the root of her problem. Please refer to the “Find a Podiatrist” tab on the www.apma.org website to find a podiatrist in your area who can help. My first question would be whether or not he or a relative is diabetic. Many diabetics experience the sensations you are describing. If he has been tested for this and is not diabetic then he does seem to have similar nerve type pain. He may have compression of the nerves in the lower extremity. This may be due to binding of a certain nerve from, let’s say, a flat foot type, or if he is athletic, this could be due to the chronic jamming of the foot forward in a shoe with exercise. In either case, the next best course of action is to seek a neurologist who can perform nerve conduction velocities (NCV) and Pressure Specified Sensory Devise (PSSD) testing to help narrow the cause down. A podiatrist will help eliminate abnormal biomechanics as a cause. There are medications that can help reduce these sensations. Your neurologist and podiatrist will help you find the right medication combination if need be. It sounds like you need a good pair of functional orthotics. These devices are custom-made for your foot and their job is to help realign the osseous and soft tissue structures, providing optimal alignment and function during stance and ambulation to help alleviate discomfort. You will need to see a podiatrist to have these made and to find out insurance coverage for these and there will more then likely be a waiting period to have these made. These are truly the ones that our custom to your foot (rather than shoe size) You may find a podiatrist in your area by visiting www.APMA.org. In the meantime, you can visit www.faant.com, go to our online store and then click under the heading on the left called “Pronation”. Product # 67 is the “Orthofeet BioSole-Gel Self Forming Orthotics Soft” which adds a lot of extra cushioning on top of the support. These will definitely tide you over until you can get some custom ones made! I’ve lived in cheap rubber flip-flops for at least seven summers and generally wear cheap shoes year-round. I have pretty flat feet and am relatively sure I over-pronate. But I have been blessed to avoid foot pain, so I generally never thought about the importance of “good shoes.” I have had just a little occasional arch pain lately, though, and as I prepare to have a baby and anticipate carrying a little one a lot, I thought I would invest in a good pair of shoes. I bought a pair of Chacos after hearing them so highly recommended as healthy for your feet, but when I tried them on, I found them pretty uncomfortable. The arches were so high that my feet were hurting after standing and walking in the Chacos for just half an hour. I was relieved to put the flip-flops back on! What I’m wondering is, do my feet NEED this kind of support and they’ll just get used to it and stop hurting in the Chacos if I keep wearing them? Or will they always hurt, and I just need a different kind of shoe for my flat feet? I don’t want to keep and wear such an expensive shoe if it’s just going to be painful all the time, but I’m willing to pay the money and undergo temporary pain if this is really so much better for my feet (and back, shoulders, etc) long term. So basically, when I run, the 1st mile in I’m fine. But then gradually a pain that wraps around both my ankles develops, and it gets worse and worse until I can’t tolerate it and I start to walk. The pain continues when I begin to walk, although 30-60 seconds later it usually wears off to a point where I have no pain. Then when I try to run again, the pain develops within a minute and I have to walk again. But the weird thing is, it happens on some days, and not others. I can go through a whole week of running with my track team with no ankle pain, and then that Saturday when I go out for a run, my ankles kill me as I just described. The running conditions are equal, same surfaces, etc. I went to the podiatrist and they at first thought it was shin splints (which I knew it was not, because I’ve had them before), but then when I said that pain is on my WHOLE ankle, including the back of the foot and all the way around, they concluded that it was pain from my growth plate that has not completed fusing. On both feet, he took a total of 6 x-rays. But I don’t know how much I believe him. I’ve had the pain before. I had it during the Fall, during Cross country. But in the Fall, I had the problem where my ankles would hurt so bad, only if I didn’t run the day before. But it was the same pain I have been feeling recently, except recently it has been worse than ever. The first day of track and field in the Spring, my distance coach made everyone run way too much, and the same went for the first week of practice. Instead of gradually working our way up to our target workout and running time, he jumped right in, more or less, with us running 4-6 miles the first week of practice. I had to skip a few days because I almost couldn’t walk after the workouts he gave us, because I hadn’t ran since the Fall. Maybe because he started me off to rough, it caused this problem? I thought it could be a stress fracture, although the doctor said it probably wasn’t. Now let me describe the pain. It doesn’t feel like muscle pain or bone pain. It’s just really hard to explain. It seems like the pain (same in both ankles) radiates from the center of my ankle until it becomes so intense where I can’t run anymore. It almost feels like what sore muscle would feel like, except it is condensed in a smaller area (around my ankle) and is much more intense and intolerable. The doctor told me not to run (ugh…) for 7-10 days, and after that, go back out and run and see if it still hurts. If so, come back and I’ll see a foot doctor who is a runner, so knows more about running than he did. Overall, I spent over an hour in the exam room between getting the x-rays, and the doctor and his intern discussing what it might be. They looked pretty clueless to me. Does do you have any ideas? Wow! You have really had time to think this through and I am impressed by your eloquence! I am curious as to what foot type you have. Most people I see (and I see a lot of runners and use to run myself!) with ankle pathology have a flat foot type. Now let me tell you, not all flat feet look flat when you look at them and people will swear to me they don’t have one when they do. It is not necessarily how the foot looks when you look at it, rather it is more what the foot does to compensate for how the foot functions that matters. It is key that your physician watch you walk and run. It is key that she or he evaluates the forefoot to rearfoot to leg relationship when your foot is placed in neutral. It is key that she or he looks at the bones and joint structure and alignment on X-ray. Only then can the best course of conservative treatment be made. With out having done so myself, I can only guide you so far. First and foremost, most of my athletes do better with their respective problems in a functional orthotic. A functional orthotic is a device that replaces the factory insert in your athletic shoes and works by realigning the boney and soft tissue structures, thereby improving foot function. Placing your foot in proper alignment removes much of the excessive strain that leads to various pathologies. Mind you, I am not talking about an orthotic that is made off of a mold of you stepping into a foam box (impression type mold) or walking across a plate. A true functional orthotic is one that is made by molding a fiberglass type slipper or plaster type slipper onto your foot while the foot is PLACED in neutral position by a trained podiatrist. (I do not know of an orthopedic specialist that do what podiatrists do in this respect.) We are trained to be able to do this in medical school and residency. If the skill is not kept up with (a podiatrist who won’t take the time to do this method), however, the technique will be lost. Now there are many podiatrists who will disagree with this “orthotic casting” view point, but there are many more who swear by it, and if you think about it, it just makes more sense. Once your foot is placed in proper alignment, and the running is resumed, we can have a better idea of where we can go with you. Unfortunately, having a custom orthotic made will take time as the mold is sent to a lab where the orthotic is made according to your specifications based on your symptoms and foot/ankle type. In the mean time, it is important to have something better that what you have in your shoes, and the arch supports you find in stores will not cut it. Not as good as custom, but better than store bought, are inserts sold to professionals. I carry a few in my on-line doctor store (go to www.faant.com and at the bottom you will see the “visit our on-line store” icon. Once there, go down the pathology list on the right to “pronation”). While I can not have all the inserts I would prefer to have on this site, the closest insert I would put you in whilst on your search for an “orthotic casting podiatrist” is the Orthofeet BioSole-Gel Self Forming Orthotics Sport. Work your way into them. Do not run in them until you are 100% comfortable in them. (if your feet or ankles get sore wearing them, take them out and let them rest, putting them back in when you feel better) When they are comfortable,work your way up in mileage with them in your shoes. Yes, this does absolutely mean cutting back on your running. It is hard to heal a hurt ankle when you are pounding on it. I say run for ¼ to ½ the time you normally run and stop. Work up adding another ¼ to ½ every 3 days depending on your symptoms. You may also want to wear a lace up ankle brace if the insert alone does not cut it. Under the “ankle pain/strain” section is the Royce – Exoform Ankle Brace. Try this in conjunction with the insert, not to replace the insert. Last but not least, consider getting an MRI if these simple things don’t work. There are things that can show up on MRI that are not seen on X-ray. Remember, having not seen your ankle, this is about the best advice I can give you unseen. Any further advice or treatment must come from a podiatrist who has evaluated you and whose advice you trust enough to follow. You can go www.APMA.org to find podiatrists in your area. Very best of luck to you! You may be right on with this one as your symptoms are in sync with Tarsal Tunnel. You may have quit what caused it but now you sound chronic. Please gather a “team” (podiatrist and neurologist) and get a good work up done which should include nerve conduction velocities and EMG. If theses are negative, get an MRI. Ask about Lyrica to help with your symptoms in the mean time. Good Luck! I am otherwise a healthy woman, except on the soles of my feet I constantly experience burning sensation. I am not in the pain. I am able to exercise, do cross country skiing, hiking, etc. I do not have a problem sleeping. It is just this constant burning sensation or like ants walking on the soles of my feet when I walk or sit. I try exercising my feet to get the blood moving, put ice pack on my feet whenever I can, I am massaging bottom of my feet but nothing seems to help. Can you recommend something else I can try? Do you have an experience with the leg and foot massaging equipment for around $400? Are they any good? My calves get sometimes very heavy and tired. I can’t sit for a very long time. Flying in an airplane or going to a theater makes my legs very restless. Is this a circulation problem? Any recommendation what could I try to relieve these problems? I forgot to mention that I have flat feet and I use inserts all the time. If you have a history of diabetes in the family, I would get checked yearly. This presents very much like diabetic neuropathy. Assuming you have recently been checked for diabetes and you do not have this, and the fact that you have flat feet, you may be experiencing Tarsal Tunnel Syndrome. Flat feet put excessive strain on the nerve that supplies sensation to the bottom of your feet. When this nerve gets compressed, it results in the symptoms you are describing. Over the counter inserts may not support your arches enough. The best thing you can do immediately is get functional orthotics to reduce the biomechanical strain. Please get these from a podiatrist who will actually get a cast molding of your foot (not handed to you by shoe size, not by scanning your feet and not getting a mold of your foot by stepping in a foam box.) Your podiatrist can also evaluate your condition. You may also need to see a neurologist who can do tests to check for nerve entrapment. There is medication that can help in your symptoms. I do not like medicating, but if an orthotic doesn’t cover it, sometimes meds are necessary to alleviate these symptoms. Do not waste your money on foot massaging equipment (put it towards the orthotics instead). Good luck! Bunions are very much a hereditary condition in a juvenile patient. She may also have flat feet. Orthotics can to slow down the progression of her condition, but if she is already having pain and the orthotics do not work, then surgery is the most likely answer. Please fill free to visit my web site at www.faant.com and go to the “patient information” section. Here you will find more information on bunions, flat feet and orthotics. Good luck! OK, I have a foot question and I know you might not be able to answer without an exam but any suggestions/thoughts would be very helpful!! I’ve tried to be as descriptive as possible…. My left foot: To start, the inside of the heel is painful if you put pressure on it. Not at the base but starting right above the bone and continueing for about an inch up from that point. I’m not sure if this is related or not to what I’m actual asking about so I thought I’d mention that. It’s been about, 3 months with that heel pain. My real problem: I have been having pain in my toes with certain foot movements for about a month or so now. If I try to curl my toes they can only get about halfway before it starts to hurt, if I try to go all the way it’s extremely painful! I have a bump on the top of my foot, not noticeble unless you touch it. If you look at the top of both my feet the left one is noticeable a bit higher as a whole, not just the bump area. If I press down on the small knot it sends a tingle from that place all the way down to my toes, kind of like an electrical current is the best I can describe it. No pain. Pushing harder this sensation turns to pain running down my foot. Basically the same feeling as when I curl my toes hard only starting from the middle and going down. Do you have any idea of what this might be or anything I can do to aleve this?? A lot of times after I have been walking/running it just has a dull pain to it which is quite annoying. I’ve taken to putting a bag of ice on the top of my foot just to numb it and make it feel normal briefly. Anything is helpful! Thank you so much in advance!!! The bump you are describing seems to be putting pressure on the nerve that provides sensation to the top of the foot and when you compress it, you get tingling and pain. This is called “neuritis”. If the bump is from a cyst, then sometimes we can inject it with cortisone and shrink it. If it is caused by bone, then things get more complicated. You can try skipping the laces in your shoes over the area or wearing orthotics to try and change the position of your foot in your shoe. If neither helps, you may have to resort to having your podiatrist shave down the bump surgically. The other pain to the heel, called “plantar fasciitis” can extend up the inside of the heel because there is a nerve that innervates the inside of the heel in that area which can worsen the condition. If the pain is more along the ankle bone, then that could be tendonitis or another nerve problem known as “tarsal tunnel syndrome”. Hope that helps! Now get to your podiatrist and get better already! My daughter has a small hard blister-like growth on the bottom of her foot. It is transparent and painful if squeezed or pushed on. Thought it might be a wart, but it doesn’t look like any pictures that I have seen. Any ideas? Every so often I come across a question that I wish I could answer sight unseen. This is one of them! There are so many different types of lumps and bumps that present on the feet that, without a visual, diagnosis is very difficult. I have seen some warts that appear more “transparent” than others, so it is not out of the question. There are also other lesions such as Porokeratosis that present similarly. Your daughter may have also stepped on something and could have a retained foreign body. Please refer to www.APMA.org and click on the “Find a Podiatrist” icon. Your daughter really should have this lesion evaluated. I suffer from Morton’s Neuroma. What is the best solution for the burning sensation I get. Thank you. Supporting the foot to control the abnormal biomechanics causing your Morton’s neuroma and offloading the forefoot is the easiest conservative treatment for a true Morton’s neuroma. Please refer to www.faant.com online store to order the “Power Step metatarsal relief pads” (I believe it is #215 in our product line). This is a pad that helps to offload the forefoot to relieve the pressure under the ball of the foot. Please try this alone as well as in conjunction with an arch support (we have many available online as well.) Your choice of arch support would depend on what types of shoes you wear/activities you participate in. If this does not help, please appoint back to your podiatrist where further evaluation can be performed. There are a few products on my website that specifically address your problem with your feet. Please visit www.faant.com and go to the on-line store. On the left side you will see various conditions to choose from. Go to “dry and cracked skin”. I really like the Hydrostat cream as I have used the product before. It does not feel greasy. Depending on the amount of dryness of your skin, you might also want to consider the Callex ointment which may be greasier but even more hydrating. Heel sleeves are also available to wear over night. A combination approach of lotion or ointment during the day and the heel sleeve at night might be best! As far as the little spots are concerned, you did not mention them itching, which could indicate an athlete’s foot problem, or growing, which could be a more serious dermatological condition. They are probably nothing to worry about. If they change in their appearance or become painful, however, I would most definitely have them checked out. I had a corn on my fifth toe. I used keralyt gel and the corn is now gone, but the skin in my toe where the corn was located has become discolored. Is there something I can use to bring the natural color back to the skin on my toe. I don’t want to lighten the skin. I just want the natural color to return. I think the best thing you can do is to wait it out. You did not mention how long ago you stopped using it. It may take a long time for your natural color to return. Mind you, skin color is rarely normal from the corn having been there so long, so you may never get the normal coloration back and there is no product that could “bring it back”. If there is itching or dryness, flaking, and redness associated with the blisters, this could represent a chronic athlete’s foot infection. Try using over-the-counter Lamisil cream which needs to be used twice daily for one month. Any less than one month and you may continue to have recurrences. If you have already done this, please go to www.APMA.org to find a podiatrist in your area to have this properly evaluated. I have a blister-like growth on the top of my 2nd toe (right at the cuticle-line of the nail). It’s a gelatinous bump that’s been there for quite awhile (several months). It’s definitely not a blister, but that’s what it looks like. If I push on it, it flattens for a minute or so, then puffs back up. I finally got the nerve to stick a pin in it (I know….not the smartest thing…). Clear gel-like stuff came out. A little blood too, but VERY little. I squeezed it fairly flat, but after about 10-15 minutes, it was puffed up again like before. It looks like another one might be popping up on the next toe, but is extremely small. I had a medical doctor look at it, and suggested I got to a podiatrist. But I’ve just been really curious about what it might be. Any ideas…? This sound like a mucoid/mucous cyst to me. I know, the name sounds ugly, but this is simply a cyst formed from some fluid that has “herniated” from the toe joint that lies under the cuticle. Some times a cortisone injection zaps it and sometimes you need surgery to have it removed since they do like to recur. Hi. I have a large blister on the BOTTOM of my heal. I’m not sure of the cause–I run and have been playing pick-up basketball the past couple months. How do I heal this blister and how can I prevent one from coming back? Thank you! Sound like athlete’s foot! This stuff is a pesky condition that is rampant during the summer months. Buy some over-the -counter Lamisil and use it twice a day for a month even if your symptoms improve before that. If you see no improvement or your symptoms worsen in two weeks, please follow up with a podiatrist in your area. Do not forget your Summer Soles in your shoes to absorb the sweat, which is a huge culprit in recurrent athlete’s foot. Less sweat means less moisture and less chance for the fungus to get out of control! I have been struggling with some little red watery blisters on my feet for about 2 yrs now. They come out and then dry out and go away after a few weeks. They don’t itch or smell or anything. I get like 5-6 blisters at once. They look like chicken pox but very tiny. I have been given steroid cream at the doctor’s but it has not helped. My spouse has gotten them from me too. Can you give me any advice on what it is? Could be athlete’s foot. Try using Lamisil Cream (this is over-the-counter) twice a day for a month to try and get rid of it. Use “Lysol Tub and Tile” in your shower weekly to disinfect and help keep your spouse “blister” free! If this does not work, have your dermatologist or podiatrist do a skin scraping on it to have it evaluated. Good Luck! Thank you for your e-mail. To get to the point, yes there is a better topical way to attempt to eradicate the nail fungus. Onychomycosis, which is the fungus that you see on your nail, has its roots in the nail bed. There is a prescription called Penlac whose mechanism is to penetrate the nail plate over time, eventually reaching the nail bed and killing the fungus where it grows. This is the only FDA approved topical medication that can actually eliminate the fungus on the nail bed. Improvement is seen as the new nail grows out, which typically takes six to nine months. Recommended use for this product is one year or more. I would probably give it a success rate of about 70% in its ability to completely eliminate the fungus on the nail bed (this is called a mycological cure). Most people however do relate a significant improvement in their nail appearance even though they might not have a mycological cure. Unfortunately, the saying “fungus amongus” is true! The fungus is everywhere and one can inoculate themselves at any point in time. Typically, a moist, warm environment is ideal and that is why many people inoculate themselves in locker rooms, showers, by the pools, or on the lake. I have seen many people who have fungus who do not usually wear socks with their shoes. Repetitive trauma to the nail is also a good way for fungus to inoculate itself. This is typically seen with people that exercise. I do recommend you visit with a podiatrist in your area to make sure that what you are describing is in fact onychomycosis so that the appropriate prescription can be written. I have a question regarding toenail fungus and permanent toenail removal and would be grateful if you could provide me an answer to my questions I have about it. My boyfriend who is 46 yrs old has had toenail fungus for quite some time now. His toenails quite frankly look very gross!!! I don’t mean to be rude but they area HUGE turn off… they just look very appalling. All of his toenails are affected by it. I take great care of my own feet with weekly pedicures and I expect my partner to as well but he refuses to get treatment for his toenail fungus because he has crohn’s disease (takes medication for the crohn’s) and cannot take the oral medications to attempt to eradicate the toenail fungus because those medications would put his already at high risk liver into too much jeopardy. Therefore I brought up the subject of PERMANENT toenail removal to him. Not temporary removal because that does not get rid of the fungus of course (but permanent toenail removal) for ALL of his toenails since he is unable to or refuses to take care of them whatsoever and the fungus has been there for a long time and is slowly getting worse. So my main question is… is this a GOOD solution do you think… to have permanent toenail removal done on all of his toenail? Basically I want him to be de-clawed like a cat! But what I’m mostly concerned about is will the skin be perfectly normal after the toenails have been removed and it has healed? Or will the skin be very strange in that area where the nails used to be? And what about the cuticle… when you do permanent nail removal how do you ensure that the cuticle NEVER grows back? Because that would be very strange to not have any nails but have cuticles still growing on your toes when you don’t have any nails on them. Or am I incorrect in thinking this and the cuticles would also be prevented from growing back along with the nail??? When you remove the nail bed I suppose the cuticle is also permanently stopped from returning, am I correct? And my other main question was… in general how much does it cost to have 10 toenails removed? Removal of all of his toenails is a pretty radical solution for this problem, especially if they do not cause him pain, because of the potential risk for infection (as is the case for any procedure). If his case is as extensive as you say involving all of his nails, then there is potential for transmittal to his foot resulting in Athletes foot. If this is a chronic problem, then permanent removal is a very good option for him. Permanent removal (called a Matrixectomy) is usually accomplished under local anesthesia using chemical called “Phenol” at the nail root, which sits underneath the cuticle, to keep the nail root from producing nail. It is about 90% effective in preventing the nail from coming back. The cuticle does not “grow”, and stays as is. The nail bed may be sensitive for some time after that, but that usually resolves and most people are happy with the appearance of the nail bed. I suggest you consult with your podiatrist for their experiences with matrixectomies as I am only speaking of my own. As far as cost is concerned, that would be better answered by your podiatrist should your boyfriend decide to proceed! My two big toenails are yellowing in color. One big toe is also curving in on each side and the nail seems to be lifting from the nailbed. I have another smaller toenail that is growing upward and has completely left the nailbed. I was to my family doctor this morning and they tested me for toenail fungus. The results were negative, so they are suggesting I see a podiatrist to look for answers. Do you have any insight or suggestions for me. I really can’t afford to see a specialist. Many times a fungal culture comes back negative even though it is obvious that a fungus is present. If you really are seeking treatment, you really should see a podiatrist. In the meantime you can try something over the counter. Mind you, topical medications will take one year of continued use to see results. If you go to http://www.ourdoctorstore.com/crane/ and to the ‘nail fungus’ section, you can start using “Tripod NailStat”. This will at least suppress the fungus while you get to a specialist. My big toe…just one has no cuticle. It is possible that I may have a fungus starting. I have been using a topical on the nail for awhile. My nail is not thickened or yellow, but has got white spots. I wanted to try right away to stop it if it was a fungus. The rest of all my nails look fine. I have however been spooked and have been treating all of them ….just in case. I have also tried tea tree oil. This one nail seems to be very stubborn. Since this toe was the only one that I noticed had no cuticle, I know something must be “lingering” there. Does a cuticle ever grow back? That would mean that maybe it was healing, but I see no signs of a cuticle even trying to form. Is this weird? The cuticle is basically the skin at the base of the nail, so you definitely have one. I think you may be speaking of the lunula, which is the semi-circular lighter area at the base. This may be occluded by the fungus. It also sounds like you have only tried the over-the-counter remedies for the fungus. If it hasn’t cleared, you should try something prescriptive. A prescription will give you the best chance of getting rid of it at this point and getting back a more normal appearing nail. Good Luck! I am in desperate need of an answer to this question. I used to get pedicures all the time, but ever since my big toes on both feet have this ugly look to where I have to keep them polished. Its not nail fungus according to my ARNP that I see (she couldn’t give me an answer), but they look like they have been “scraped” maybe with a nail file or something. It just has a white,scraped look to it. Do you have any idea what it is and what could I do to fix it? I haven’t had my nails done in a long time, I just polish them myself since I think the cause is because of the salon. A response would be appreciated! How is the temporary toenail removal process done? I have toenail fungus on my big toe on my right foot. The podiatrist stated that if the topical cream doesn’t work, that I could think about temporary removal of the toenail. Thank you for your time. I have 2 corns on my third and forth toes on the right foot. I’ts been over a month now,I tried Dr scholl corn remover bandage and liquid remover and nothing works. After 3 days the skin will peel off but it still is hard and looks like high bumps and very unattractive on my toes. Please help, because I can’t wear any flip flop or sandals and it’s summer. Thank You. My big toe is infected. It is swollen with pus and red just below the nail. My podiatrist gave me an antibiotic and suggested removing the nail so the pus can drain. Then he said the nail may grow back healthy and pretty, or thick, yellow and ugly or never grow back at all. He did not tell me what type of infection it is – bacterial, fungal, etc. and did not give any reason as to why it happened. Removing the nail seems so radical. Is this a good idea? Is there another alternative? -Thanks! I am 19 years old and have been dealing with hereditary ingrown toe nail problems for years. About a year ago I lost one of my toe nails after accidentally kicking it into a door. The nail fell off and it healed over in no time with no problems. The nail has mostly grown back by now but I’m finding that I’m having even more problems with the nail than I had before. I try different ways of trimming it and everything but nothing seems to work. Half of the time I can’t wear a shoe because of swelling and the pain the rubbing of the shoe causes. I’ve been considering permanently removing the nail for a long time now but the only issue is cost. Would you be able to give me any idea of how much it would cost to permanently remove this annoying nail before I contact a doctor. Just so I can have a basic idea before hand of what I’d be in for.Thank you so much! Every doctor’s office is too variable to give you cost. I have been asked cost questions before and I can never give an answer. Your best option is to call several doctors offices in your area and get a rough estimate. It would only take you a few minutes. Best of luck! Medical conditions are fact-dependent, so in addition to Dr. Karpati’s insights, it is important you consult with your personal physician before undergoing any footcare treatment.